Things to do everyday to become rich faster than other people. Some simple habits can make you a rich person if you can maintain them well. Look out the rich people habits what they do, learn from other successful person who already got it, become a better entrepreneur ever is the path to be rich. Lets check out How to become a millionaire? Good habits are the foundation of wealth. The difference between successful people and ordinary people lies in the daily routine. In other words, successful people have a lot of good habits and bad habits are extremely low. If you can recognize the bad habits are preventing yourself become rich, this is the first step for you to change your fate. It is recommended that you obtain the paper, divided into two columns. A record of bad habits, and converts them into a well. For example, instead of watching TV too much, now you just watch one hour a day. Or write the name of the paper to memorize them, instead of trying to remember mentally. After 30 days, you will be amazed at your progress. I wish you to become rich & successful in your early life. Successful people always act in the target. They constantly set goals and to pre-plan a workday. Successful people are those who know the visionary. They have goals for each day, week, month, and year. But the goal will not mean anything if you do not plan to achieve. So next set goals, successful people are trying to find ways to implement them and always take responsibility for myself. Successful people are always looking to improve themselves themselves. They read books every day and learn to improve expertise. They never waste time on things that do not help yourself approaching the target. Successful people know that time is extremely valuable asset and should be used only for his work. Self-improvement is a commitment to implement actions to train myself. Look for a way to expand understanding. This is not easy, but people can only grown since the ordeal. Once you have the knowledge, opportunities will come to you. However its not that easy all time to become rich and success but you should keep trying. Every day, successful people are exercising and eating healthy. Diet is extremely important. Exercise can become a daily habit, as well as bathing. People who exercise regularly will use accumulated a lot of energy to complete the plan in place. Successful people are the center of attention of the people around. They spend part of their time to strengthen friendships and establish long-term relationships. They always take the initiative in contact and help others without expecting a response. Someone once said, the most beautiful sound in the world is his own name. So, try to remember the names of all the people you meet. Ask yourself, would not you not impressed with someone's name remember me? It is an effective way to make an impression and the difference for yourself. You will achieve balance in life if you know living in moderation. This means that the sort of work activity, diet, exercise, drinking, watching TV, surfing the web ... in a scientific way. Thus, people would like to join you. When they like you, you will have many opportunities in business cooperation to benefit their work. The today not tomorrow. Please complete all of the work has started. All people have fears, but successful people will break the fear aside and try to complete the important task at all costs. It is advised that when thoughts appear to delay work in the beginning, just repeating the phrase "to do right", and do not stop until the job was finished. Pro tip: To become rich and successful "What you start you must finish it, either its get the result positive or negative". Most successful people are optimists, enthusiastic and dynamic. They always look at the good points of ourselves and others. For them, the main problems are opportunities waiting to be explored. Every day we are inundated in countless news about bad things happening. Achievers will minimize exposure to this type of news. Instead, they nourish your soul with positive thoughts from the book. Become rich today or you will never be. Success will come to you by walking only if you run for it. Successful people often spend 10-20% of their income to add to savings accounts, investment or retirement reserve. The rich are always trying to avoid overspending. Meanwhile, many others are struggling with financial difficulties due to spending too likely. They spend more than the amount earned and fell into debt. If you are in this situation, change the right to be able to better control its finances. A lot of successful people spend at least 30 minutes each day to reading. Reading can open up your knowledge. Spend time reading means you're striving to improve ourselves, help yourself stand out and different from those around them. Did you know that most successful people never watch TV than an hour a day? Time spent watching television can be used to do other work much more productive. Instead of completing assigned tasks, successful people often do more than that. They volunteer to do things not in their obligations and thereby improve self-worth. If you are an entrepreneur, you will not have to manage your boss and tasked him. However, keep working hard and dedicated to impress customers. You always learn something when listening to others. That is why humans have two ears but only one mouth. The others listened not only useful, but also to benefit your work. When paying attention to what other people say, you can help them better. Do not be discouraged if you get stuck. The rich always find a way to manage to overcome all obstacles. Maybe they will have to change its direction, but always moving forward. There's a saying: "Tell me who is your friend, I will tell how you are." Successful people will associate with people as well as their success. These relationships will help you soon achieve their goals. A lot of people have been glorious success is thanks to the teachings of his mentor. A seasoned predecessors experience will transmit to you the valuable lessons and help you achieve success faster. When you understand the reason for her to do, you will achieve what you want faster. Having clear goals is an extremely important thing to succeed in life and business. Ask yourself why you desire to succeed? 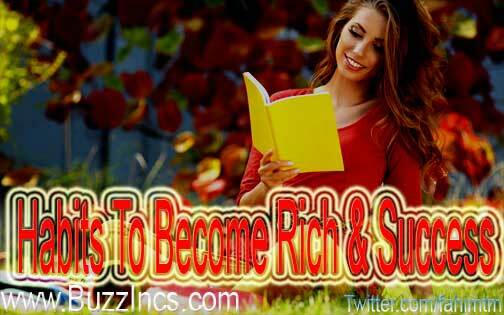 For what you want to become rich? But success will not let fear hold back their development. Admit your fears to yourself and find ways to overcome them. You should consult someone you admire or learn the biographies of the rich to see if they had overcome the fear like. To succeed, the only way is to make themselves better in their field. What might take you to the peak of his career in 30 days? Let's focus on it, that is pursued to the end until you reach for success.